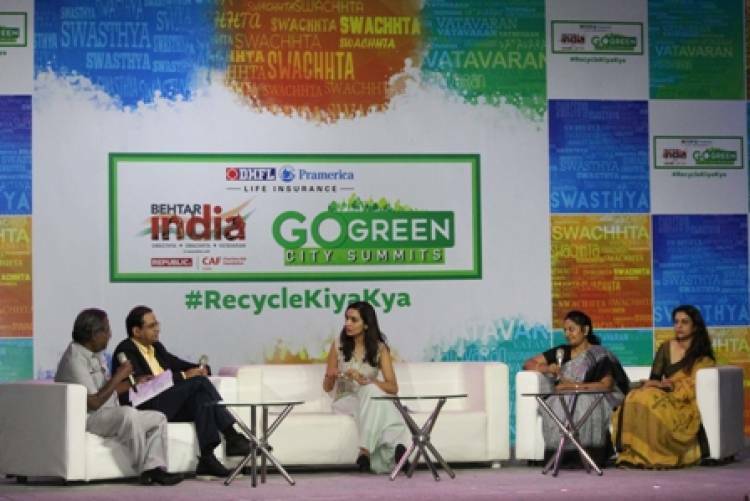 Chennai, October 10, 2018: After the grand success of its three recent city summits in Bangalore, Kolkata and Hyderabad respectively, DHFL Pramerica Life Insurance has successfully organized its fourth Behtar India Go Green City Summit at Shree Niketan Paathshala in Chennai today. The school earned the coveted distinction of hosting the Behtar India Go Green City summit by recycling 16,834 kgs of waste, the maximum amount collected by any school in the city. The second season of Behtar India campaign has moved into its second leg wherein the campaign is being taken across to 10 different cities such as Bangalore, Chennai, Delhi, Mumbai, Kolkata and Hyderabad among others. Launched last year, the Behtar India campaign supports the community to step forward and help itself in achieving better health, hygiene and environment standards. The eight month long campaign is focused on three main pillars– Health, Hygiene and Environment with recycling as its core theme. Acknowledging the efforts, Mr. Anoop Pabby, MD & CEO, DHFL Pramerica Life Insurance, “We have received an overwhelming response from the schools and students in Chennai. The city has recycled close to 39,000 kgs of waste since the inception of the campaign in April 2018 adding to the total collection from South India to 1,82,867.5 kgs. We would like to extend our heartiest congratulations to the children of Shree Niketan Paathshala who have come forward and taken part in the ‘Behtar India’ campaign and put in their efforts towards adopting recycling as a habit. Over 36 schools have so far registered for the campaign in Chennai and close to 263 schools from South were a part of this initiative. I urge more companies and schools to come forward and be a part of this campaign so that this message reaches to as many people as possible”. ‘Behtar India’ is a one of its kind Collaborative Social Responsibility campaign that rallies to get different segments of the society together to work towards making their cities cleaner, greener and healthier. The unique format not only supplements the government's efforts to provide promotive as well as preventive healthcare to the community, but also ensures quality curative healthcare and behavioral change in the fields of hygiene and environment. The initiative is a contest for schools and students, a CSR and an employee engagement window for companies, social service for individuals, an amplification tool for the municipal corporations and for the under-privileged children, it is an opportunity to receive free health benefits. So far, ‘Behtar India’ campaign has recycled over 5 lakh kgs of waste nationally that has helped save 1,20,09,745 litres of water, 8,507 trees, 4,504 barrels of oil and 22,018 household’s one month’s electricity. At the same time, the 15,012 Dengue Protection Kits have been distributed to the under-privileged children as part of the Behtar India campaign till now.